(LINKS TO REFERENCES BELOW) In this 39th edition of the Techno Crime Fighters' Forum, the Joint Investigation Team discuss the global holocaust program that is being conducted by the international intelligence agencies, which are actually all part of one single global secret service, the One Agency. 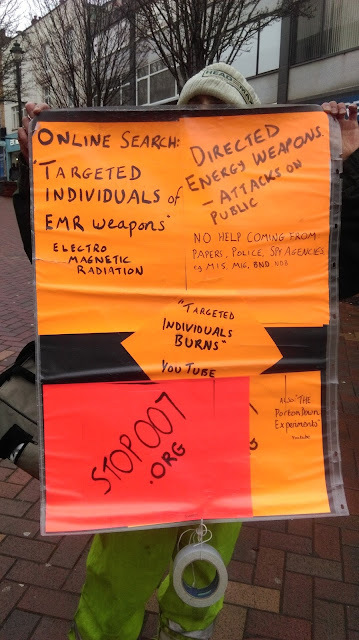 This is the weekly public report of the work of the Joint Investigation Team, which is investigating crimes committed with directed energy weapons, military neuro/biotechnology and systemic corruption. THE JOINT INVESTIGATION TEAM: https://jointinvestigation.org/about/ SUPPORT THE TEAM: https://stop007.org/home/support-our-... MEMBERS OF THE TEAM: (1) Dr. Katherine Horton, a High-Energy Physicist and expert on Complex Human Systems, https://stop007.org/ (2) Karen Melton Stewart, retired NSA Intelligence Analyst and expert on Weapons Development & Proliferation, (3) Pastor Dr. Millicent Black, expert on Violence against Women and Military Neuro/Biotechnology, (4) Ramola D, Investigative Journalist and expert on Secret Service Criminality, https://everydayconcerned.net/ (5) Melanie Vritschan, founder of ICATOR and expert on Civil Rights & Military Neuro/Biotechnology. http://icator.be/ The broadcast is published by Dr. Paul Marko, an Organisational Psychologist with 30 years experience: http://pineconeutopia.wordpress.com ================================= LINKS: ================================= Dr Paul Marko's & Mindy's new platform: https://pineconeutopiaportal.wordpres... Ramola D Reports: https://www.youtube.com/channel/UCrcQ... Dr. Millicent Black's petition: https://www.change.org/p/stop-false-d... Karen Melton-Stewart's petition here: https://petitions.whitehouse.gov/peti... and here: https://www.ipetitions.com/petition/f... FEEL FREE TO UPLOAD THIS VIDEO TO YOUR CHANNEL. THIS IS A PUBLIC INTEREST BROADCAST. TRANSLATIONS TO OTHER LANGUAGES ARE INVITED. Book a private 1-on-1 Consulting or Counselling Session with Dr. Horton. Service offered to victims, their families and professionals who would like to understand the technology and its effects. Download the affidavit draft template in OpenOffice (like Word) or PDF format and let Dr. Horton know if there are any aspects of your targeting that haven’t been taken account of in the template. The final version will be released on Thursday 19th October 2017 after consultation with the victim community. and LIVE IN GERMAN on the Stop 007 YouTube channel each Friday at 6-8pm UK time (7-9pm Central European Time). Relaunching Thursday 15th June 2017 and running until the middle of July. We are contacting all US States and 156 countries of the world to deliver them an ultimatum to stop the Global Death Camp Program immediately. Join us now! Dr Horton’s urgent appeal to everyone of integrity along with Prof Eric Karlstrom’s very important talk on the background was kindly published by Ramola D’s The EveryDay Concerned Citizen and is reprinted as a backup here. Dr. Katherine Horton is an Oxford-educated scientist and a victim of the intelligence agencies. She urgently needs your help! 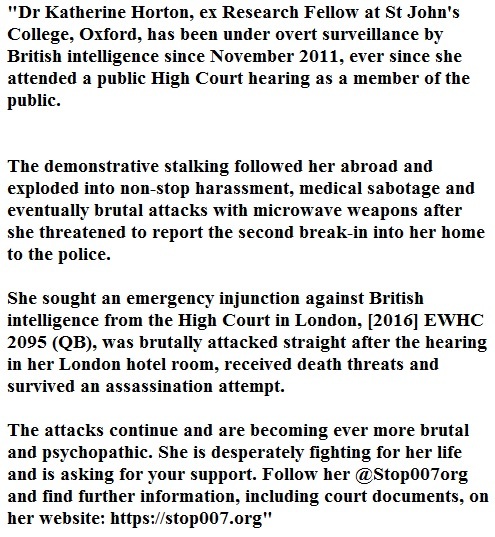 She has been harassed for 5 years and is brutally mutilated with military-grade microwave weapons since 2015 that maim her daily. Can’t believe that this could be happening? In fact, it is the predictable outcome of our military and government systems. Everybody involved benefits hugely (apart from the victims), so it is a run-away process that recruits willing perpetrators. READ MOREHOW IS IT ALL POSSIBLE? … unless YOU kick their door down! Please help to save victims’ lives and stop this madness that is to be launched on you. READ MOREHOW YOU CAN HELP! The Joint Investigation Team fighting the Nazi mutilation program needs your help. Appeal to all victims to provide an affidavit of the crimes committed against them. Dr Horton’s High Court case is one of many against the intelligence agencies. To stop the psychopaths you have to hunt down the Nazis and remove them. The Tsunami Email Campaign to Save Humanity – stopping the Death Camps. Your donation will be used for my court case and to support other victims with my work.